We have parts for older models of Vibra-Steamer Garment Finishing Tunnels, Gentle Touch Finishers, etc. that were mfg. 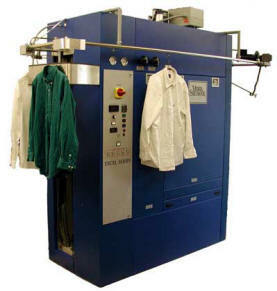 by Fremar Inc.,& Western Automation Corp.
Vibra-Steamer® Garment Tunnel Finishers revolutionized the laundry and dry cleaning industries by providing a fast, efficient method to finish garments. The very first steam finishing tunnel so used was a Vibra-Steamer. Our Vibra-Steamers have proven their dependability in more than 30 years of in-plant service. To date more than 6,000 Vibra-Steamers have been distributed throughout the world. The unique design of our Vibra-Steamers ensures consistent, top quality finishes for your garments, plus efficient use of your energy dollars. Two full length air-filled cloth sleeves (bags) at the entry and exit of the drying chamber rotate at the same speed as the conveyor travel. These let the garments in and out, but help keep heat in, so it is efficiently reused. Vibra-Steamer® cut-away XL550 with Right hand Conveyor and options. Typical of models LDS, LDY, LDJ. Note: Models XL425, XL550, and XL750 also have entrance air seal bags. Our Pneumatic Autoloaders provide a efficient way to load tunnel finishers from conveyor systems. Spiral type loaders for loading hangers on our Steam Tunnels. : The autoloader is a self-contained, hand-loaded, loader. The Autoloader will automatically feed one garment at time onto the tunnel conveyor. Spiral type takeaway conveyors: Garments are automatically loaded onto the takeaway conveyor as they exit the tunnel. The garments are transported onto a storage rail until manually removed.